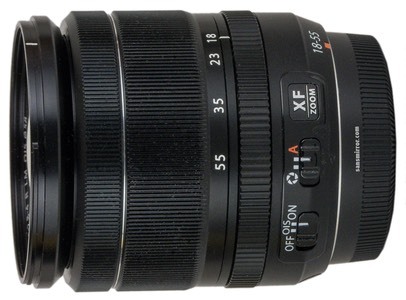 The XF 18-55mm f/2.8-4 R LM OIS Zoom Lens from Fujifilm is the first zoom lens for the X mount on their X-series interchangeable lens digital cameras. A versatile, compact lens that can travel easily and respond to a range of shooting situations, the XF 18-55mm has the focal length equivalency of 27-84mm in the 35mm format. This covers a standard zoom range from basic wide-angle to medium telephoto and is ideal for day-to-day shooting needs from group shots to portraiture, cityscapes to natural vistas. It's a great lens for street photography as well.